-Marketing Director (Track 8 - Disc 1) - The Red Strings Club Original Soundtrack - fingerspit (distributed by Bandcamp) - 2018. -Queendom (Single) - Unravel Two Trailer Song Music - AURORA - 2018 (disponible en iTunes). -Devil Trigger ... See More (Single) - Devil May Cry 5 OST - Ali Edwards - ℗ 2018 CAPCOM CO., LTD (disponible en iTunes). -Ready to Die (Track 4 - Disc 1) - I Get Wet - RAGE 2 Trailer Song Music - Andrew W.K. - 2001 (disponible en iTunes). -“Don’t Think Twice” - KINGDOM HEARTS III Theme Song Trailer - Utada Hikaru - 2018. -“Glide” written and performed by Japanese Breakfast - Sable E3 2018 Announcement Trailer (https://www.youtube.com/watch?v=y8bcIzVtLhQ). Ubisoft Music UBILOUD - The Flight - 2018 (https://www.youtube.com/watch?v=eA0nbtxfeq4). -RESIDENT EVIL 2 REMAKE OST - Save Room Theme Music - 2018. -Asylums for the feeling feat. Leila Adu - dawn - Death Stranding - E3 2018 Trailer - SILENT POETS - 2018 (disponible en iTunes). -Hornet (Track 6 - Disc 1) - Hollow Knight Original Soundtrack - Christopher Larkin (distributed by Bandcamp) - 2017. -Super Mario Sunshine "Staff Roll" (Track 10 - Disc 1) - NINTENDO SOUND SELECTION [Ending & Staff Roll] - Published by Nintendo - 2015. Podcast en el que hablamos sobre videojuegos, anime, manga, cine, música y literatura fantástica, e incluso en ocasiones de recetas de cocina. Quizás no tengamos los mejores medios ni seamos los mejores en esto pero todo el mundo sabe que las cosas que se hacen con ilusión y, sobre todo, con amigos en ocasiones merecen ser compartidas. 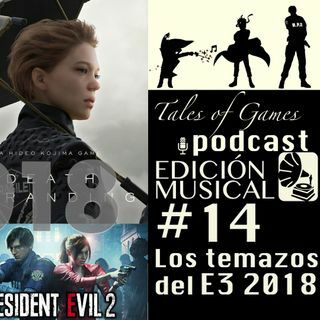 **Los temas musicales que se escuchan en el programas tienen como objetivo la divulgación de la cultura musical del videojuego y el anime.